Caribbean Gospel Radio will continue to rise. 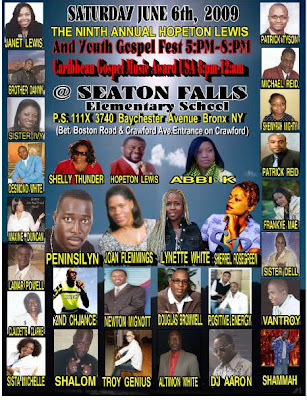 Radio shows such as Spotlight On Gospel with host Sharon Addison will continue to give an ear to Caribbean & World Gospel artists. A two time winner of the Caribbean Gospel Music Awards USA founded by Hopeton Lewis, this young woman continues to impresses her audience with her knowledge of Caribbean & World Gospel Music. Follow her on facebook and twitter to find out about the latest in Caribbean & World Gospel Music. Addison's famous tagline "We Are Spotlight On Gospel". Host of Spotlight On Gospel Radio and TV 89.1 WFDU FM Thursday Mornings 1:15 am - 6:00 am http://wfdu.fm Harvest Radio 1070 am WKMB Saturday Mornings 4:30 pm - 5:30 pm Education: BSN, Nursing. Also in 2004 graduate of CSB School of Broadcasting with Certifications in radio & television production.